If you're like us, 2GB isn't a lot these days, though I do still manage to keep my old laptop going that came with a whopping 20GB HDD, HUUUGEE storage there. Anyway, it could probably be 2kb of storage and I'd still order one, just cause it's made in the likeness of the galaxy's most notorious bounty hunter. 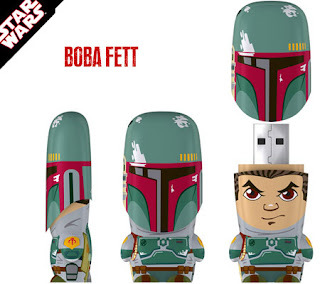 ***UPDATE*** The pictured Boba Fett flash drive is / was by MIMOBot. The edition was limited to only 5000 units and good luck getting your hands on one of these specifically. It will be another "trophy" for the bounty hunter toy collection, that is certain, and EE states pre-order now for a ship date of approximately October '09. ©2008 Lucasfilm Ltd. & TM. All rights reserved.